At Expressway Signs we understand that every one of us is responsible for safeguarding the future of our planet. That’s why we were the first company in Queensland to install HP’s latest ‘green’ innovation, a printer with 100% environmentally friendly silicone inks and recyclable media. Since installing the first machine in Queensland and only the second in Australia Expressway Signs has completely switched over to this technology and now runs a pair of HP Latex Printers. See the original articles below for more information. 11th December 2009 was a black day for environmentalists. The G8 summit in Copenhagen drew to a close and the world’s most powerful nations had reached no binding agreement to reduce carbon emissions. Many saw it as a bitter failure. Despite this disappointing outcome, some Australian businesses are taking matters into their own hands and moving towards “greener” production methods regardless. They realise that every one of us is responsible for safeguarding the future of our planet and that consumers’ desire for environmentally friendly options is set to grow. 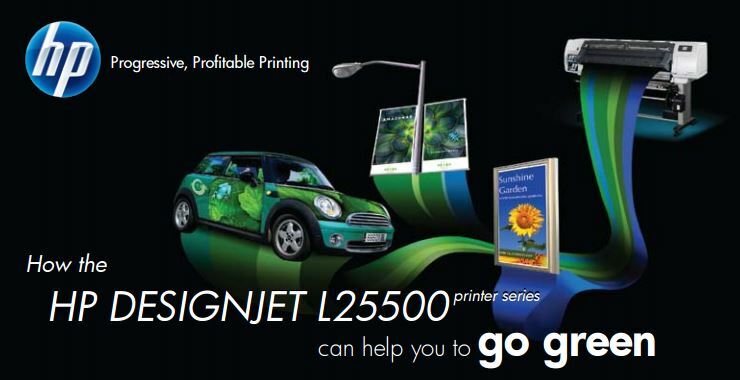 Expressway Signs is the first company in Queensland to install HP’s latest innovation, the Designjet L25500. The new printer uses silicone based inks that are 100% environmentally friendly and yet produce the same quality prints as normal ink. It’s not just the inks though. The cartridges and print media can also be recycled along with almost all the machine parts. And being green doesn’t cost customers any extra. In fact, printing using the new machine is often cheaper than traditional solvent printing. Matthew Connolly is a small business owner who has returned to Cairns after spending eight years working in Europe. He has noticed that we are a long way behind some European countries when it comes to conducting “green” business”. Matthew believes that if we all do a little, the sum of our efforts will help preserve Australia the way it is meant to be. “It should be in everybody’s interest. I want my children to have the chance to experience Queensland and its beautiful natural places just as I did growing up.” Matthew says. Expressway Signs’ new printer was installed on the 15 of January and they will host an open house event in March to demonstrate their latest investment. “This is just one of many changes that we at Expressway Signs are implementing in 2010. Our goal is to offer our clients a product that is more or less 100% green” Matthew says. In the future Matthew hopes to replace all his printers with the new technology from HP. “It does not add any cost to our clients and our 100% product warranties ensure that the new product will last, so I can’t see why people would choose any other colour than “green” for their next sign” Matthew laughs.